This July 4, hundreds rallied across the country, taking part in Restore the Fourth rallies demanding the government be held accountable for the massive revelations of spying revealed by NSA whistleblower Edward Snowden and others. Here’s a clip from that protest. 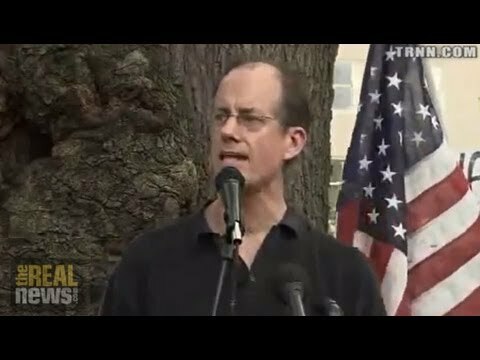 THOMAS DRAKE, WHISTLEBLOWER AND FMR. NSA SENIOR EXEC. : On this day, 4 July 2013, I call for a new American Revolution declaring our independence from the surveillance state and government control of information. NOOR: That was Thomas Drake. He’s now joining us. Thomas Drake is a former National Security Agency senior executive. He blew the whistle on multibillion-dollar fraud and a vast Fourth Amendment-violating secret electronic surveillance and data mining program that he says fundamentally weakened national security and eroded civil liberties. He was charged under the Espionage Act by the Obama administration and faced 35 years in prison. The criminal case against him ultimately collapsed and charges were dropped. Thank you so much for joining us, Mr. Drake. DRAKE: Thank you for having me. NOOR: So, Mr. Drake, you’ve come out as an outspoken defender of NSA whistleblower Edward Snowden. But recently there’s been a lot of criticism of Snowden, including on the left. I’m going to read you a quote from a piece that was recently published in In These Times magazine, which is a traditionally progressive magazine. Nothing in Snowden’s revelations concerning U.S. intelligence gathering points to any systemic violation of the law other than possibly his own. What’s your response? Are these programs that Edward Snowden revealed, are they legal? And is what Snowden did right? DRAKE: Well, that’s very convenient to say when in fact the disclosures he’s made are clear evidence that the government went far beyond the original mandate, who went even far beyond the plain language in the legislation, even though it authorized a lot of activities that had been actually illegal and unlawful under the Constitution prior to the acts, what I called the enabling act legislation being passed. Plus there’s a secret interpretation of both the Patriot Act section 215, as well as section 702 of the FISA Amendments Act. I mean, 100 million–for example–I mean, there are several now, but 100 million phone records of Verizon based on that secret FISA court order being given to NSA each and every day, that’s the equivalent of a general warrant, which is a total violation of the Constitution. Nowhere in the Constitution, or even in the enabling act legislation, as broad as it is, gave that kind of license to the government in secret to turn over the records of millions and millions–about tens of millions of innocent people, in this case, tens of millions of U.S. citizens, U.S. persons. So those who are attacking him are attacking him as the messenger. They don’t want to deal with the actual message, because it would raise the most troubling of questions. I would reverse and say, what if the same revelations had come out under the Bush administration? Well, in part they did, in 2005 and in 2006, and all kinds of people on the left were wanting to hang Bush out to dry, up to and including calls for impeachment, because he was, you know, violating the oath that he took, the special oath that he took to, you know, preserve, protect, and defend the Constitution. Those same voices are quite muted, if not silent, and submissive in the face of this unprecedented institutionalization of the secrecy regime, which has not only been accepted lock, stock, and barrel by the Obama administration, but has been greatly expanded. So there are–those voices that you’re referring to simply do not want to deal with the message and want to continue to focus on the person who brought the message. It’s classic politics of personal destruction. It’s classic ad hominem attacks. It’s classic projection, because you don’t have to deal with the extraordinarily uncomfortable truth that you actually have a secrecy president who’s actually making Bush look rather mild by comparison. NOOR: I wanted to read you one more quote. And there is a piece in Affairs magazine by Jeff Cohen criticizing MSNBC, which of the mainstream cable networks is seen as to be the more left-leaning, the more pro-Obama network. Among the hosts see targeted was MSNBC’s Melissa Harris-Perry, noting how she’s been condemning Snowden by contrasting him with civil disobedients who, quote, love their country and submit to arrest, while Snowden just wants to save his own skin. She proclaimed, this is different, this is dangerous to our nation. And specifically, critics like her have been pointing to the fact that Snowden not only had revelations on what the U.S. is doing domestically, but also what the U.S. is doing, the spying its carrying on on foreign countries such as China, Russia, and, as was revealed today in The Guardian, Brazil. What’s your response to those criticisms? DRAKE: Yeah. Well, they don’t hold any water. The only–I mean, member states have been spying on each other for decades and centuries. It’s not unusual for humans to distrust each other. The difference here is that NSA in a vast scale, both domestically with U.S. persons, U.S. citizens, completely innocent people, completely suspicionless people, without any particularized search based on probable cause, or let alone particularized, you know, identifying in a particular way the individuals or the things to be seized, you’re not only–not only is that the case in the United States–and we have not yet heard all the revelations. I’ve been telling people now for several weeks that there’s far more to this program than even what’s been exposed to date. When they find out how far NSA has actually gone to take what the Stasi said as their motto, to know everything, to a whole another level–I’ve actually said it was–NSA is now the Stasi on steroids. But now you have the revelations based on other agreements and arrangements, where the privacy and civil liberty rights of other nations’ citizens are also being violated on a vast scale. And that puts all this, even on the international scene, into a whole new dimension. This is not just classic state-to-state, state-to-military, or diplomats spying on each other. This is actually at the state level, you know, state-sponsored surveillance of citizens directly in terms of their data associated with them–telephone calls, emails, and internet use on a very, very large scale. In Europe, for example, Germany is the number one target of these arrangements. And now we’ve just heard the more recent revelation involving Brazilian citizens. So, apparently, no citizens have rights. And that’s why I’ve said we’re all foreigners now. This distinction that there’s even the figment that if you’re a U.S. citizen you’re protected flies in the face of the actual disclosures. But none of this surprises me, none of the disclosures to date have surprised me, because I knew all this when I was in the system. The difference is that Snowden was able to get access to actual documents and then provided them to reporters. I simply knew about them. But I operated in a different sphere. I was at the policy level at the very senior level. So you would hear all this in the policy level behind closed doors, but they kept the actual documents in very secure locations. NOOR: So we played a clip at the top of the segment where you were essentially saying that we need a revolution to stop the gross violations of our constitutional rights. Can you talk more about what you’re calling for? DRAKE: Well, I call for a new American Revolution, that we needed to resist the surveillance state. Remember, I have a particular, you know, keen understanding in some ways and perspective on this because during the latter years of the Cold War I became an expert on East Germany when I was flying in RC-135s monitoring the communications from that fascist surveillance state. That state became monstrously efficient in maintaining and keeping records of every citizen in the country, and ultimately history was was not kind and it collapsed. But, you know, that’s one of the primary examples coming out of the 20th century. And they didn’t have the benefit of NSA’s advanced technology. There was no internet to speak of. Computers were just starting to come in. And so–but they were monstrously efficient in maintaining just about everything there was to know in paper-based form about their own people. We now have at a click of a button the ability to create profiles and dossiers on just about anybody when we feel like it. I mean, it’s just a complete violation of who we are. And I run this exercise, what I call a privacy exercise with people. And every single time I have them do the privacy exercise, it’s always the same response. If I say take your entire life, all your passwords and all your accounts and all your credit cards and every email address, and put it into a box, drive to the other side of town, knock on the door of a perfect stranger, but a fellow citizen, and say, here, I’m giving you this box for safekeeping, would you do it? Everybody to date has said, of course not. And then I ask, why not? Well, because I don’t trust them. So then I say, well, if you don’t trust your fellow citizen, then why would you trust the government in secret, without your consent–without your consent, I want to reemphasize–with learning everything there is to know about you? Well, and then they kind of look at you funny and say, oh, I never thought about it quite that way. That’s what we’re facing. And as we saw during the Nixon administration, the ability of the government to abuse and misuse that kind of information is just–without controls, without checks, without the ability to provide legitimate and fundamental oversight, well, then we have a scenario where the government’s out of control in its ability to know everything there is to know about all of its people. And that’s why I speak out. That’s why I’ve called, you know, for a new American Revolution. I don’t want to live–I lived the past five years of my life, from 2006 until 2011, under the boot of the surveillance state. I know exactly what it’s like to have your life turned inside out and everything there is to know about your life and every account and all your email and everything else being taken in by the government to figure out why you’re such a bad guy, and then having information framed to make you look bad for their own purposes, or what it’s like to have FBI agents sitting in parked cars at the end of your street monitoring your every physical move. And as they told me during my cooperative period with them, we knew when you left home in the morning, we know what vehicles you use, we knew where you stopped, we knew when you got to work, we knew when you left work. We knew everywhere you’re going, Mr. Drake, with rare exception. Is that the kind of life we want to live as citizens, whether it’s in the United States or overseas? I don’t. And that’s why I resisted. NOOR: Now, Mr. Drake, we want to thank you for joining us for part one of our discussion. We’re going to talk more about your own personal journey and the obstacles you faced after attempting to blow the whistle on surveillance abuse in the NSA in part two. Thank you for joining us for part one, and please stay with us.